If asked, most people will agree that driving is a serious responsibility. Sadly, this knowledge doesn’t always translate into action and drivers are often careless behind the wheel. One of the most common ways in which this inconsistency between words and actions manifests itself is in driver’s approach to speeding. Most drivers recognize that speeding raises the risk of a serious accident, but that doesn’t seem to stop drivers from speeding on a regular basis. Drivers seem to assume that they are the exception, that they can handle the higher speed without the added risk. Our San Francisco fatal car accident attorney knows all too well that this is a deadly mistake. Last week, as reported by the San Francisco Chronicle, a woman entered a not guilty plea on charges related to allegations that she crashed into a family’s minivan and killed a teenage boy while travelling at twice the posted speed limit on September 27, 2013. According to the allegations, 58 year-old Jennie Zhu of San Francisco was driving a Mercedes-Benz faster than 70mph on Pine Street through a portion of the Western Addition neighborhood. Investigators believe she’d been speeding for multiple blocks when Zhu rear-ended a minivan at Gough Street. Kevin San, a junior at Lincoln High School, was killed in the crash which also left his mother and sister seriously injured. A catering van was also struck, causing three occupants to be hospitalized with non-life-threatening injuries. Zhu herself suffered minor injuries in the crash. Zhu’s attorney has said that his client has a very limited memory of the event, recalling only that she had recently dropped her husband at work when her vehicle surged forward and having no other memories until she was kneeling outside her car on the asphalt. However, the California Highway Patrol found no evidence of a vehicle malfunction. Zhu faces two counts of reckless driving in addition to a charge of gross vehicular manslaughter. She could face up to seven years in prison if convicted. 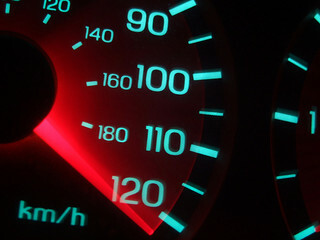 Speeding-related crashes claimed 10,530 lives in the U.S. and Puerto Rico in 2010, 31% of all traffic deaths. When asked to identify key obstacles to addressing speed-related dangers, 78% of respondents to the GHSA study cited public indifference to speeding and 61% cited public perception that speed enforcement is really just an issue of revenue generation. Concerns about staffing and funding for speed enforcement were also referenced, with the GHSA Chair noting the lack of enforcement efforts makes it hard to convince drivers that speeding is indeed a serious safety issue. The Chair also noted that an exception to the generally disappointing survey results suggested the possibility of improvement, with targeted enforcement and education efforts in Washington State leading to an almost 45% drop in the number of speed-related deaths compared to the previous five-year average. Speeding should not be dismissed as the norm. Our office takes speed very seriously and helps the victims of speed-related accidents pursue civil damages claims against those at fault. If a speeding driver harmed you or a loved one, please call us at any of our Northern California locations, including our newest injury law offices in Santa Rosa and San Jose, to arrange a free consultation to discuss your legal rights.